The second gift I’m giving you this year is a BAT. Probably not the BAT you’re thinking of though. BAT is short for brown adipose tissue or “brown fat”. When most people focus on body fat, they usually think of it as a measure of appearance or weight. But, in reality, fat is a vital organ which plays an essential role in buffering us from the elements, producing beneficial hormones such as adiponectin and providing stored energy when food isn’t available. Not all fat is created equally. Brown fat differs from subcutaneous, visceral and white fat because of its unique ability to generate heat or “burn calories”. In this respect, BAT acts more like muscle than fat. Unsurprisingly, researchers note that it is present in higher quantities in children and lean adults. But, there are a few things we can do at any age or weight to enhance BAT activation. And, there’s more reason to do so than ever before. One of the simplest ways to increase BAT activity is to spend more time in the cold. 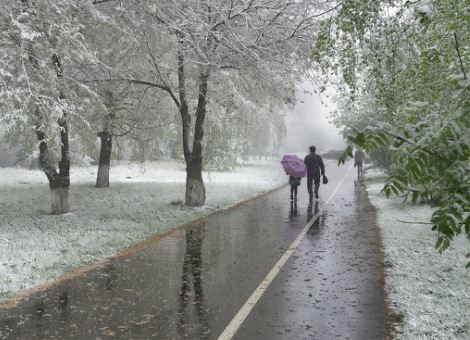 This doesn’t mean you have to book a trip to Alaska or shiver throughout the day and night. All it takes is purposefully exposing yourself to a cooler environment some of the time. For instance, a recent study found that shifting time spent from a warm environment (about 72° Fahrenheit) to a moderately cool environment (about 65° Fahrenheit) improved glucose uptake and insulin sensitivity by 20%. Likewise, the levels of dopamine and noradrenaline increased in the study participants. Perhaps that’s why a recent review in the journal, Diabetologia, mentioned “cold exposure” as having potentially therapeutic value for type 2 diabetics. Better blood sugar management is one of the best gifts you can ever give yourself. But, around this time of year, I fully realize that diet and weight often overshadow concerns about insulin sensitivity. With that in mind, I’ll briefly review how BAT activation may help keep the pounds off. The most obvious way that “feeling the chill” benefits your waistline is by stimulating calorie burning or thermogenesis. In short, you’ll burn more calories in the cold. Also, the previously noted improvements in glucose uptake and insulin sensitivity tend to minimize food cravings caused by erratic blood sugar while reducing insulin production. This is meaningful because excess insulin encourages fat storage. Finally, a recent study in the European Journal of Endocrinology reports that “cold-induced BAT activation was associated with lower serum ghrelin”. Ghrelin is a hormone secreted by the stomach that increases appetite. Bonus Gift! This one goes out to those who simply hate being out in the cold. This isn’t a substitute for periodic cold exposure, but rather a complement to it. It turns out that a hot cup of green tea may activate brown fat as well. What’s more, green tea appears to work synergistically with the cold to further increase energy expenditure. Don’t like green tea? Try adding ginger (freshly grated or in a tea bag form) while brewing green tea. The ginger taste will over power much of the grassy tea notes while supporting greater satiety and thermogenesis. Influence of environmental temperature on risk of gestational diabetes. BACKGROUND: Cold-induced thermogenesis is known to improve insulin sensitivity, which may become increasingly relevant in the face of global warming. The aim of this study was to examine the relation between outdoor air temperature and the risk of gestational diabetes mellitus. METHODS: We identified all births in the Greater Toronto Area from 2002 to 2014 using administrative health databases. Generalized estimating equations were used to examine the relation between the mean 30-day outdoor air temperature before the time of gestational diabetes mellitus screening and the likelihood of diagnosis of gestational diabetes mellitus based on a validated algorithm using hospital records and physician service claims. RESULTS: Over the 12-year period, there were 555 911 births among 396 828 women. Prevalence of gestational diabetes mellitus was 4.6% among women exposed to extremely cold mean outdoor air temperatures (≤ -10°C) in the 30-day period before screening and increased to 7.7% among those exposed to hot mean 30-day temperatures (≥ 24°C). Each 10°C increase in mean 30-day temperature was associated with a 1.06 (95% confidence interval [CI] 1.04-1.07) times higher odds of gestational diabetes mellitus, after adjusting for maternal age, parity, neighbourhood income quintile, world region and year. A similar effect was seen for each 10°C rise in outdoor air temperature difference between 2 consecutive pregnancies for the same woman (adjusted odds ratio 1.06, 95% CI 1.03-1.08). INTERPRETATION: In our setting, there was a direct relation between outdoor air temperature and the likelihood of gestational diabetes mellitus. Future climate patterns may substantially affect global variations in the prevalence of diabetes, which also has important implications for the prevention and treatment of gestational diabetes mellitus. J Therm Biol. 2017 Oct;69:238-248. Lower critical temperature and cold-induced thermogenesis of lean and overweight humans are inversely related to body mass and basal metabolic rate. It is colloquially stated that body size plays a role in the human response to cold, but the magnitude and details of this interaction are unclear. To explore the inherent influence of body size on cold-exposed metabolism, we investigated the relation between body composition and resting metabolic rate in humans at thermoneutrality and during cooling within the nonshivering thermogenesis range. Body composition and resting energy expenditure were measured in 20 lean and 20 overweight men at thermoneutrality and during individualized cold exposure. Metabolic rates as a function of ambient temperature were investigated considering the variability in body mass and composition. We observed an inverse relationship between body size and the lower critical temperature (LCT), i.e. the threshold where thermoneutrality ends and cold activates thermogenesis. LCT was higher in lean than overweight subjects (22.1 ± 0.6 vs 19.5 ± 0.5°C, p < 0.001). Below LCT, minimum conductance was identical between lean and overweight (100 ± 4 vs 97 ± 3kcal/°C/day respectively, p = 0.45). Overweight individuals had higher basal metabolic rate (BMR) explained mostly by the higher lean mass, and lower cold-induced thermogenesis (CIT) per degree of cold exposure. Below thermoneutrality, energy expenditure did not scale to lean body mass. Overweight subjects had lower heat loss per body surface area (44.7 ± 1.3 vs 54.7 ± 2.3kcal/°C/m2/day, p < 0.001). We conclude that larger body sizes possessed reduced LCT as explained by higher BMR related to more lean mass rather than a change in whole-body conductance. Thus, larger individuals with higher lean mass need to be exposed to colder temperatures to activate CIT, not because of increased insulation, but because of a higher basal heat generation. 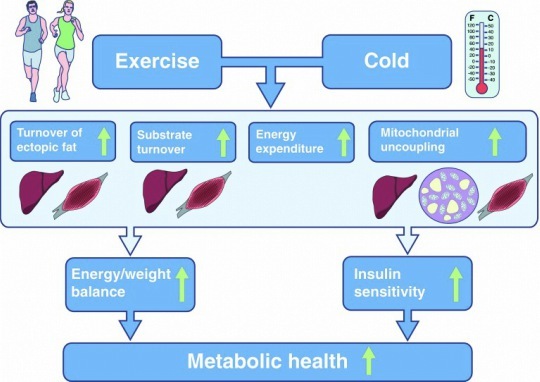 Our study suggests that the distinct effects of body size and composition on energy expenditure should be taken in account when exploring the metabolism of humans exposed to cold. The Effect of Dietary Supplements Containing Green Tea, Capsaicin and Ginger Extracts on Weight Loss and Metabolic Profiles in Overweight Women: A Randomized Double-Blind Placebo-Controlled Clinical Trial. BACKGROUND: This study was conducted to determine the effects of dietary supplements containing green tea, capsaicin and ginger extracts on weight loss and metabolic profiles among overweight women. METHODS: This randomized double-blind placebo-controlled clinical trial was implemented among 50 overweight women. Participants were randomly divided into 2 groups. Group A received dietary supplements containing 125 mg green tea, 25 mg capsaicin and 50 mg ginger extracts (n = 25) group B received placebos (n = 25) twice with lunch and twice with dinner daily for 8 weeks. RESULTS: Compared with placebo, taking dietary supplements containing green tea, capsaicin and ginger resulted in a significant decrease in weight (-1.8 ± 1.5 vs. +0.4 ± 1.2 kg, respectively, p < 0.001) and body mass index (BMI; -0.7 ± 0.5 vs. +0.1 ± 0.5 kg/m2, respectively, p < 0.001). In addition, subjects who received green tea, capsaicin and ginger co-supplements had significantly decreased serum insulin concentrations (-2.6 ± 3.9 vs. -0.6 ± 2.0 µIU/mL, p = 0.02), homeostatic model of assessment for insulin resistance (-0.5 ± 0.8 vs. -0.05 ± 0.6, p = 0.01), and increased quantitative insulin sensitivity check index (+0.01 ± 0.01 vs. +0.001 ± 0.01, p = 0.008) and plasma glutathione (GSH) levels (+73.8 ± 120.6 vs. -28.3 ± 193.4 µmol/L, p = 0.03) compared with the placebo. CONCLUSIONS: Our study indicated that taking green tea, capsaicin and ginger co-supplements for 8 weeks among overweight women had beneficial effects on weight, BMI, markers of insulin metabolism and plasma GSH levels.